New independent record labels were popping up all of the time by the end the 1940’s, all with big dreams and little chance for prolonged success. If there was an actual bandwagon it’d have a broken axle by now from everybody jumping on it in an effort to capitalize on the growing niche markets that the long-dominant major companies mostly ignored. This of course included rock ‘n’ roll which was no longer an uncertain proposition for those daring entrepreneurs in the record industry. What had first emerged in New Orleans two years ago this month back in September 1947 was now a nationwide phenomenon, at least in the black community. Yet the two men who first took a chance on it, David and Jules Braun, owners of DeLuxe, a New Jersey based label that had made even earlier inroads into the Crescent City, no longer were at DeLuxe, having been forced out when they sold controlling interest to rival label King to provide them with an influx of cash to meet their bills. So now they were back with another new label, Regal, also operating out of New Jersey and once again they were focusing on New Orleans for the bulk of their talent… actually they were mostly taking the stars they’d developed at DeLuxe with them to their new imprint. 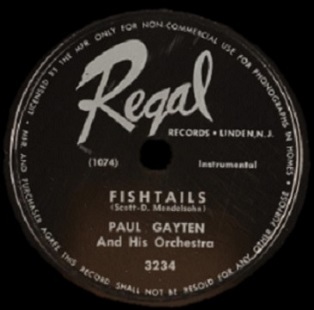 Foremost among them was Paul Gayten, the first New Orleans based artist they had signed in the spring of 1947 who had also provided them with their first hit on DeLuxe. Now he was looking to do the same for them at Regal. This was already Gayten’s second release in the roughly two months since the label opened its doors, the first being a re-worked take on a song he first did on DeLuxe a year earlier, now dubbed Dr. Daddy O in honor of New Orleans first African-American deejay, Vernon Winslow. We’ve had plenty of fun over rock’s initial 24 months with studying the names these companies gave to instrumentals, everything from looking like a shopping list for a southern barbecue to the titles being used to curry favor with disc jockeys as a form of payola. Or was it? One reason for the confusion is because there are two released versions of this record, the same word being used except in one case it was singular, in the other it was plural. Which was the intended title would tell us a lot more about what they were aiming at. 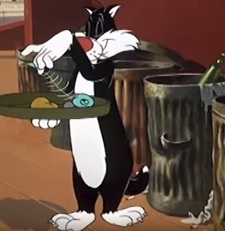 If it were Fishtails, plural, then you might have another dish to add to the culinary lineup of rock instrumental titles, though I’m not sure how common eating fishtails is unless you’re a cartoon cat scrounging for food in an alley. But chances are that would be the inference in naming it such. But upon closer examination of the times that wouldn’t appear to be the case at all, as the subject of this song probably doesn’t come from the sea but rather the garage. 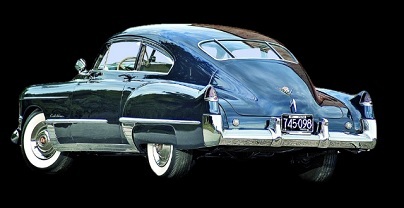 It’s likely (though not guaranteed) that the title refers to the relatively new invention of what later came to be known as “tail fins” on a Cadillac, which first appeared on their 1948 models. At the time they were commonly referred to as “fishtail Cads”, something that Floyd Dixon sung about so memorably on last month’s Red Head ‘N’ Cadillac with Eddie Williams and His Brown Buddies. Now of course as with all instrumental records it doesn’t matter what the tune is called. There are no lyrics, thus no story line to give it an identity. The music within would be the same no matter what title adorned the label, so other than being something reasonably eye-catching and memorable these song titles were mostly incidental. Just a way to request a record you want to buy or a song you want to hear. But in the rock market we know that isn’t entirely true. The genre had built much of its reputation on the attitude and outlooks its songs had projected from the start, a mixture of a confident defiance when it came to society forcibly holding black America back and resurgent optimism about the chances of upending that social construct. The younger audience hadn’t only responded to the exciting style of music rock featured, but also the bolder messages inherent in many of the songs. Once that progressive viewpoint became a major selling point of rock ‘n’ roll the artists were increasingly expected to meet that need in their songs, reassuring listeners that they were of the same mindset. When we’ve seen popular artists waver in their commitment to this line of thinking, such as The Ravens did when they recorded The House That I Live In, with its blanket praise of America that seemed to whitewash racial prejudice, they were eviscerated for it by black audiences. Obviously an instrumental record like Fishtail wasn’t going to run that risk, but by alluding to the Cadillac in the title, a widely known symbol of upward mobility, they’d tie themselves in with that mindset which couldn’t hurt when it came to drawing interest. But a suitable name wasn’t the only qualification for connecting with rock audiences… it had to deliver the goods musically and be just as forward thinking in that regard as its title implied. Any time Paul Gayten has popped up on these pages, whether as a featured artist or when backing his main discovery Annie Laurie or a number of other New Orleans based artists from Chubby Newsom to Eddie Gorman and most recently on the debut of Mr. Google Eyes, we’ve never quite known what to expect when it comes to content. On one hand Gayten could be as visionary as any artist in rock ‘n’ roll, with arrangements that were ahead of their time and perfectly situated to be on the cutting edge of rock as it neared a new decade. On the other hand Gayten was equally fond of looking backwards and embracing mannered pop contrivances that were anachronistic in their construction. His band at this time featured some of the best musicians New Orleans had to offer who would become cornerstones on some of the most vibrant rock ‘n’ roll coming out of the Crescent City in the 1950’s, but while they were cutting their teeth on a wide array of material under Gayten, it was on songs like Fishtail where it became clear they were also being dreadfully underutilized. Now to be fair you can certainly make the case that not all records – especially by someone as versatile as Gayten was – had to be rousing rockers that appealed to your typical hell-raisers and moral degenerates that made up a good portion of the rock crowd. So to that end we’ve tried to respect his divergent aims and have avoided reviewing those songs he or Laurie issued which were aiming for a different listener altogether. In many ways it’s even admirable that he cast such a wide net in his musical career, something that would make him all the more valuable as a record producer, talent scout and bandleader on the road behind a plethora of acts big and small over the years. His own recorded output also ran the gamut from instrumentals that showed off his piano playing to vocals that encompassed both demure ballads and racy uptempo sides. So just because the name on the label was Paul Gayten’s didn’t mean you had any right to believe it would contain a single specific attribute you’d come to admire from his work in the past. There were many sides to his musical persona and – frustrating though it might be – you always rolled the dice when you plunked down your 79 cents for his latest release, hoping that it met with your approval, but being guaranteed of no such thing. About all you could do short of splurging on a spin of each side on a jukebox that carried his record was to try and glean some hint as to what style they might be based on the song titles alone. Sometimes you’d get something slick and modern, maybe like a fishtail Cadillac, while other times you’d be handed something with a rather strong odor like a bucket full of discarded fishtails. Which is why in this instance we have to take issue with both Regal Records and Gayten himself for quite possibly intentionally misleading us with what they called it. For surely on a song dubbed something as enticing as Fishtail there comes with it certain expectations that it will meet our needs in the rock community. To deliver anything short of that payoff is somewhat deceptive… even out and out dishonest, or dare we say treasonous. Obviously the fact it is being reviewed means this song isn’t completely removed from rock ‘n’ roll, but it’s by the slimmest of margins that it qualifies. Even that tepid endorsement is as much to try and delve into Gayten’s thinking as he went along as it is to analyze the record in question, which is decidedly jazzy in bent and distinctly New Orleans in its components. The latter is really all that makes Fishtail interesting in any way, as the vaguely Dixieland atmosphere this takes on at times when the trumpets start delivering their squawking refrains is something that really only gets exposure nowadays during shallow stories on Mardi Gras or the New Orleans Jazz Fest each year. But if its main offense was to go a little too heavy on the Dixieland attributes that’d be easy enough to comprehend and even to excuse in a way, as what proud Louisiana native wouldn’t want to use their national profile to expose the rest of the country to some local flavors they might not otherwise sample? Yet that only comprises a very small element of this meandering song, as the bulk of it alternates between three other distinctive, albeit incompatible, sounds that turn this into a nondescript misfire. The first thing that jumps out isn’t exactly the horns playing a somewhat rapid fire refrain in the intro, but rather the ticky-tack drumming which is so prominent behind it. This approach has you hoping it’s done in a manner reminiscent of how Big Jay McNeely utilized it on The Deacon’s Hop, where the technique served as a time bomb for the explosion that followed… or if you’re a pessimist the sound of it (sans the ensuing explosion) has you cringing that Gayten has once again turned away from the more primal musical aspects of rock for something more suited for a jazz nightclub where people debate the latest French films while trying to look both cool and bored with the unhip denizens that surround them. The drums quickly give way to the one aspect that connects it back with rock, that of Lee Allen’s saxophone which leads a slow dreamy riff that repeats with increasing volume as the Dixieland trumpet barges in before Allen gets his solo and brings the volume and the pulse back down. The other horns can’t leave him alone, not that Allen was doing anything more than acting as a pleasant sedative for those who wanted to eschew barbiturates and were too cheap to buy another round booze to put themselves under. But at least his saxophone was played rather inoffensively and therefore wasn’t going to disturb you much before you headed home. Then comes the drummer again, acting like an unwelcome jolt of caffeine to the system, snapping your eyelids open and making you look around for whatever showstopper the band was about to bring on stage, maybe a stripper if you’re lucky. No, you aren’t lucky, because the headliner is Paul Gayten himself and he keeps his clothes on, but he also keeps his musical adventurism to a minimum, which we regret, though it’s too late to refund your cover charge at this point so you’ll just have to suffer through it with the rest of us. I don’t know why he felt this mawkish right hand playing would be at home in this song, but at least he doesn’t stick around long, just long enough for you to look for an exit. In the end you get the distinct impression that the title alone was the limit of the song’s creativity. None of the song’s parts fit together, which is problem number one. The intro doesn’t segue neatly into the sax solo, which isn’t allowed to build any momentum before the others intrude, and just when you’ve resigned yourself to that conflict the drummer reminds you of his presence which spurs Gayten into playing something best suited for an entirely different song in an an entirely different setting. From there other components return for an encore that nobody requested, nobody appreciates and nobody will remember. …If they’re lucky that is. Yes, Paul Gayten is a talented artist in many ways, his versatility will be much appreciated around here for a lot of the next decade. But he’s also someone who continually failed to focus on what he did best for the audience who supported those endeavors most fervently. As a result he was never embraced wholeheartedly by the rock fanatics because in turn he never seemed to wholeheartedly devote himself to them. That lack of awareness as to the requirements of appeasing the most ardent fan base which made up rock ‘n’ roll was on display here, so even when giving you a title up your alley with Fishtail often times you were simply left holding a rather unappetizing discarded skeleton of a rotting piece of seafood instead. 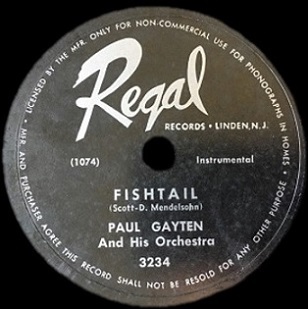 Leave a reply on "Paul Gayten: “Fishtail”"